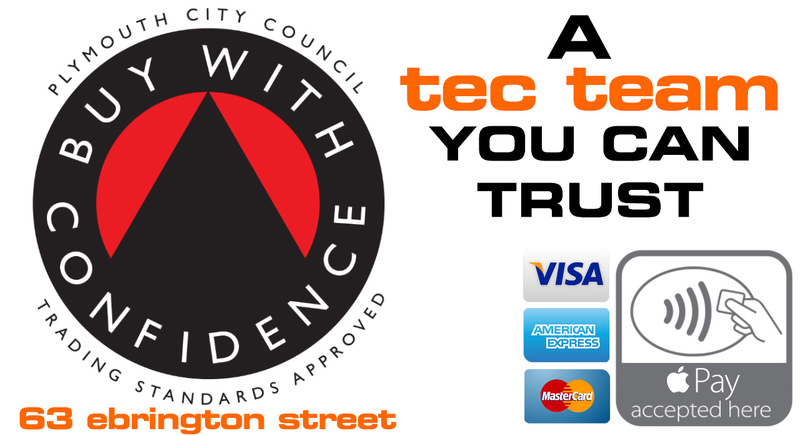 Tec Team Plymouth (Tech Team Repairs Limited) are proud to announce that we have now trusted by our local Trading Standards Office at Plymouth City Council. This means we have the correct procedures in place to deal with customer complaints, but most importantly our procedures have passed. This means you can be assured that your consumer rights as customer at Tec Team are not in doubt. Its always been our aim to provide service over profit, thats why we have a ever growing customer base. We are also proud to announce today that we now accept Apple Pay as well as American Express, Visa and MasterCard, its unfortunate that we must pass on any charges for these payment methods, We apologise for this but our reasoning is that we want to keep all our customers paying less for their repairs and support. 1 – Tec Team does not accept responsibility for any previous damage to my device or peripheral devices. I am responsible for making note the condition and accept Tec Team are not liable for any changes in the condition unless Tec Team have been negligent. 2 – Tec Team does not accept responsibility for backing up any data or installed software that may be on my device. I am responsible for making sure that any critical data is backed up before bringing my device to Tec Team. 3 – When I drop off my device the Tec Team technician will give me an estimate of when the repair or maintenance will be finished. If this estimate changes, the technician will notify me at the phone number listed above (we reserve the right to change an estimate). 4 – I understand that when I bring in my system for repair and/or work that I will be charged a minimum of 1-hour work (£45) on the device. Any further work needed will be quoted. If no repairs were possible or repairs where parts were not used failed to fix the issues described Tec Team will not charge. 5 – When I pick up my PC, I will make sure that I also pick up all peripheral devices and media, and I will not hold Tec Team responsible for the subsequent loss of any items that I may leave behind unless Tec Team have been negligent. 6 – I understand that in the event of theft/fire/flood damage that although the device will be replaced Tec Team cannot insure against data loss. Data is my responsibility. 7 – Tec Team cannot be held responsible for further faults found during diagnosis and repair, we will contact you and discuss if additional issues arise. If necessary the PC will be returned as received should you not wish to proceed with the repair. 9 – On collection I have checked the equipment and agree that it is in satisfactory state as when it was left with Tec Team if possible I do understand some repairs can make cosmetic perfection impossible and that other repairs by there nature may change the look or feel of my device. We are committed to ensuring that complaints will be investigated quickly, fully and fairly. Our customers must be confident that we take complaints seriously and feel that they are able to make a complaint with ease and that during any investigation, our customers are listened to, respected and kept informed at all times. Any deficiency in our working practices found following the investigation of a complaint will be acted upon as soon as possible. The majority of matters can be dealt with as they arise by the staff concerned. However, where a complaint is not resolved in this way the matter will be brought to the attention of Mr S Briggs. A record will be made of the complaint and (NAME) will, with the assistance of any other relevant member of staff, address and resolve the problem, completing the complaints log at that time. A written acknowledgement of the receipt of the complaint will be sent to the customer within 14 working days, then a full response as soon as is practicably possible following the investigation process. A record will be kept of all complaints which will include full details of the investigation and any action taken. Name and address of the complainant/customer. Date of receipt of complaint and acknowledgement date. 5. Details of action taken with dates and by whom.